Versatile athletes need weight training for strength, cardio for endurance and technique. Pilates is tainted with a bit of a “aging bored housewife” stereotype, but it is great for the flexibility and core fitness needed for top technique in most sports. I have also started practicing Pilates every week with a group of guys in the neighbourhood. And if you want to see a real manly pro then check in with Lindley (photo) at One & Only Reethi Rah who offers “Stott Pilates” instruction. The “Stott” variant focuses on the “natural curvature of the spine” rather than a more straight alignment of conventional Pilates. 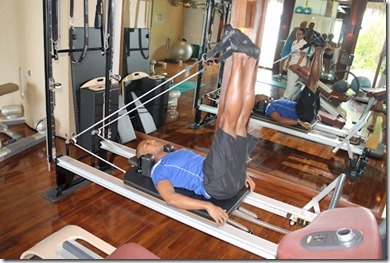 Our sessions at home use maybe a ball or a band, but Reethi is kitted out with a number of high-tech specialist Pilates machines for the most advanced workout I’ve come across. Today is a double holiday in Thailand – both the King’s Birthday, honouring Thai tradition and culture, and Fathers Day. The latter is more than a card occasion and is marked by this official holiday. Someone who will be marking the day is Prasit Latsila Sujith K.V. 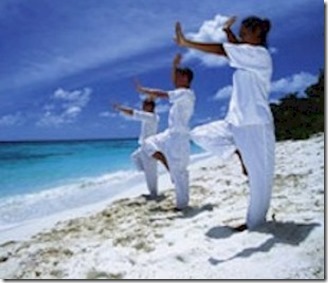 from Phuket who teaches yoga, tai chi, and Pilates at Centara Ras Fushi. 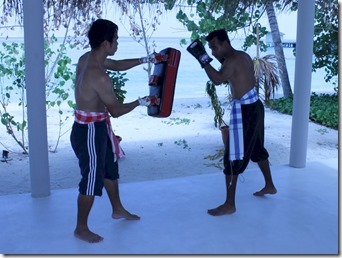 He also teaches the ideal sport for today – Thai Kick Boxing. As it happens, Thai boxing skills are typically “passed down through the generations” according to Prasit and he learned the art from his father. He competed when he was young and studied it at university. Another curious fact about Thai Boxing (or Thai Kick Boxing) is that it is the second biggest sport in Thailand. One of the first things I learned running Piero (sport television graphics) is that “Football” is the #1 sport in nearly every country in the world (“American Football” in USA, “Aussie Rules football in Australia, and “Soccer” football everywhere else). The variety comes in which sport is the second most popular. Motor Racing, Basketball, Ice Hockey and Rugby are the most common “2nd sports”. 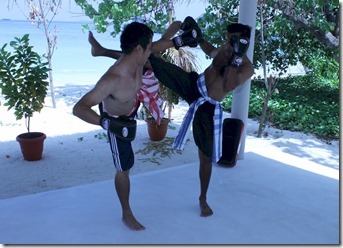 Thai Kick Boxing is one of the rare solo seconds, ie. the only country where the sport is #2 (another example of a “solo second” is Netball in New Zealand and Squash in Egypt). Prasit offers regular and requested classes at the waterside yoga pavilion which is part of the resort spa (see photos). A session starts with the “Ram Muay” which is a “show of respect to the teacher” and a warm-up. And today in Thailand, is one big “Ram Muay” for wisdom imparting fathers everywhere. National Fitness Day today in both the USA and the UK. A chance for us to work on shaping up those body shapes for our own beach photoshoots. On the Maldives Complete Profile pages, I try to limit the material to the key things people are interested in. One of these is a picture of the Fitness Centre. 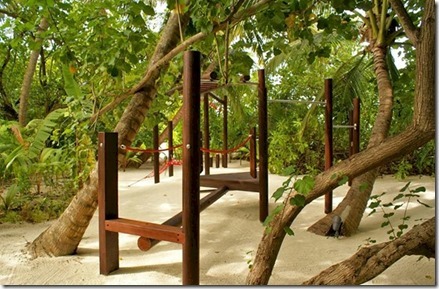 A good number of folks on the Maldives TripAdvisor Forum are always when people ask about the gym or workout facilities. Why on Earth would you want to do anything with the word “work” associated with it in the indolent Maldives?? 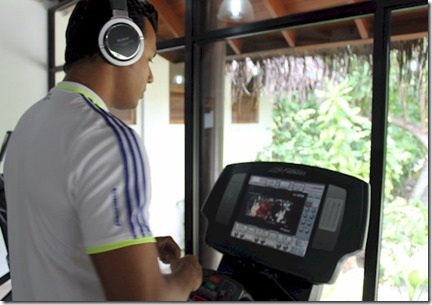 Well, on my holidays in the Maldives, workouts were one of my top priorities. 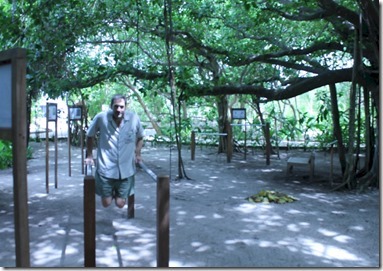 Unlike when I am at home, in the Maldives, I am rested and eating well. So my body is ready for some good exercise. As a more restless individual, it gives me something to do. The climate and surroundings are idyllic which are much more invigorating for a good session than trying to motivate oneself to go out in the chilly, damp of England. 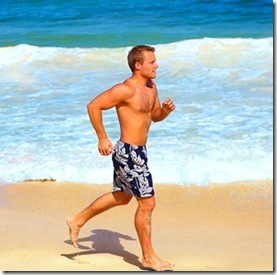 The whole time can be a bit of a physical bootcamp to re-boot the body. Like everything in the Maldives, there is usually a “Beach” version. 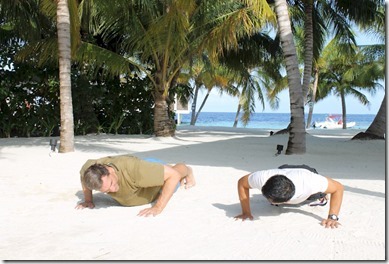 And Jumeirah Dhevanafushi offers a superlative Beach Bootcamp. It was started by Elmer who also pioneered Zumba in the Maldives. It was a “Tabata Bootcamp” developed by the Japanese to train their Olympic athletes. A high intensity interval workout like circuit training. 20 seconds of working out followed by 10 seconds rest for 8 rounds making a 4 minute segment. I sampled it when I visited the resort (see above and directly below) and it was as challenging as any hour long session I had ever done. 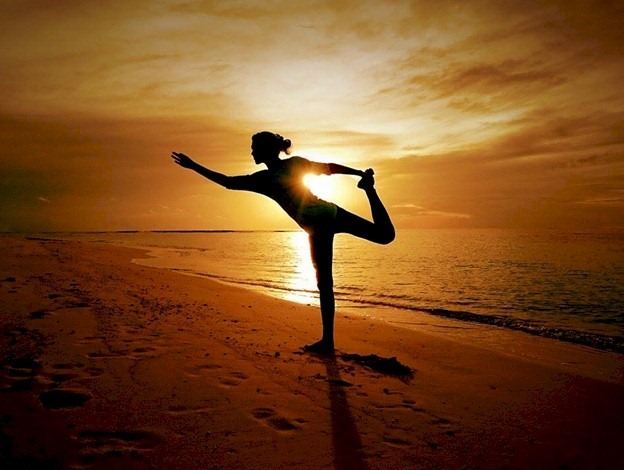 The bootcamp is now offered by physical instructor Tanya Shapoval (who also guide the yoga practice – see below). Incidentally, just started practicing yoga regularly myself (ouch!). Even the nicest floor-to-ceiling glassed, over-water fitness centres in the Maldives mean that you have to go inside for some exercise. You have to extract yourself from the sunshine, fresh air, squawking tropical birds, and fragrant blossoms to get your heart rate up a bit. You typically have to put on your shoes for the only time in your no-shoes get-away. 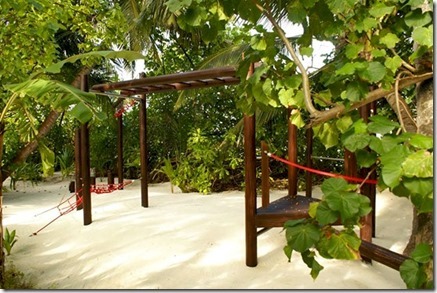 But JA Manafuru sets a high bar for activity-on-offer in the Maldives…quite literally. 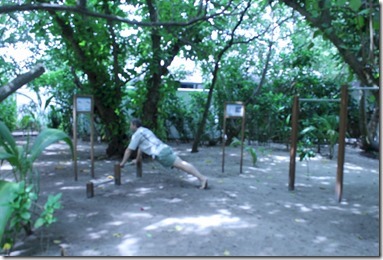 As their adventure exercise course actually includes a number of “bar” exercises (see photos here). The whole circuit is spread out around the island so you can jog from one set of exercises to another. All of the exercises included illustrated instructional signs. The areas are even lit at night so people can use them during the cooler evening if they prefer (as does the front office manager Jourden who told me that he does the course nearly every day himself). Zumba is a fitness craze that has is just about everywhere now, but in the Maldives it is only at the Jumeirah Dhevanafushi resort. Like a number of aerobic trends, the key to its popularity is injecting a strong dose of fun into the workout so there is less pain with the gain. Zumba’s fun is dance. Dance based fitness which has been sort of the core of aerobics for years (think “Flashdance”). But aerobics always seems like fitness first and dance second…exercise set to music. Zumba is more music first and fitness second. Think musical movement amped up enough to provide some fitness. 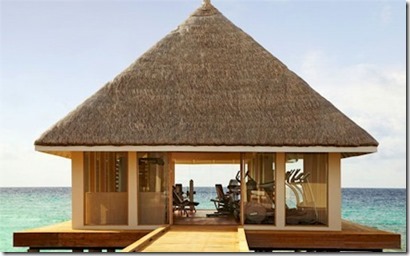 Dhevanafushi's exclusive offer is thanks to their spa staffer, Elmer Munar. In fact, Elmer was the first to introduce Zumba to the Maldives offering it for periods at a number of resorts, but now he is resident at Dhevanafushi. He holds classes at their over-water Talise Spa which provides a visual vista as energizing as the music and Elmer’s charismatic class leading. No need to wrest yourself away from the ocean to just enjoy a bit of cardio. Elmer welcomes you with a cold lemonade and scented towel (which I found myself returning to several times during the session). He is licensed Level 2 in 5 of the 7 Zumba styles – Fitness, Sentau, Toning, Kids and Kids Jr. It’s like a buffet of Latin dance. Lori and I did cha-cha, salsa, mambo and Cubiya moves with a cool down to the bachaba. All the moves are simple and repetitive to make them easy to pick up. They all can be embellished as you get better. Elmer is clearly an expert and once the class settles into its own groove, he adds a number of flourishes to his own steps providing a bit of extra dazzle and fun to watch. It’s hard to find a bit of dancing in the Maldives. Usually, it’s the occasional DJ enlisted for an evening or two. For any one who likes a bit of getting their groove on, Elmer’s studio is a must stop. If a running machine seems just too monotonous for you, you might want to go to the other extreme with Coco Palm Dhuni Kholu’s obstacle course (thanks Paola). Tumble in the jungle. Usually resort fitness centres are stuck away in some remote interior corner. 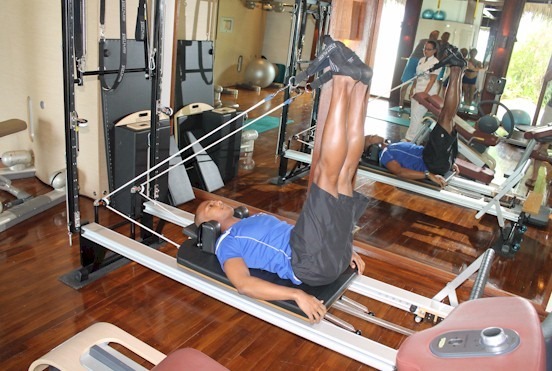 Tearing yourself away from your relaxation for a workout is hard enough that you don’t need the resorts to tear you away from the beautiful surroundings to boot. On the contrary, having a vista of paradise to look at would be a great distraction from the tedium. Viceroy’s over water fitness centre’s superb design fully exploits the brave move to place it over water with floor to ceiling windows and two large sliding doors to invite even more of the inspiring outdoors into the gymnasium. Probably my most memorable spa treatment ever (not just in the Maldives) was at Kuramathi’s over-water treatment villa open floor to ceiling on 3 sides (including the west side for a bonus sunset view). My dream rejuvenation double would be a hard workout at Viceroy with the ocean breezes wafting through the gym to infuse me with strength, followed by a mellow deep tissue rub-down at Kuramathi with the same breezes soothing me. The epic London Marathon takes place tomorrow so which resort is the best place for entrants to get their training in. Once you have carbo-loaded at Kuramathi, head to Shangri-La Vilingili for your training runs. Most Maldive islands would have you running laps being little larger than your typical running track in circumference anyway. Vilingili has 3 jogging trails for a total of a four kilometre route. A luxuriously long patch of ground in the terrain challenged Maldives. Soneva Fushi also offers ‘hidden’ jogging trails and is a much larger island, but Villingili offers an eight-minute speedboat ride away ‘a 17-kilometre road, which is the longest in the Maldives’ which connects 5 neighbouring islands. Good luck to my friend Mark Deakin who will be one of the 6000+ runners and he is raising money for the Oxford John Radcliffe Hospital if you want to lend support.